Exciting news – Holberton is introducing a new Corporate Partner’s Network as a way for organizations to support the vision of bringing diverse and qualified talent to the tech industry. Joined by Google, Scality, Accenture, and CloudNOW, Holberton is creating a way to further its dedication to providing quality tech education to the most. These Corporate Partners are in the unique position of being able to nurture their dedication to diversifying the tech industry while simultaneously benefiting as a direct result. At Holberton, quality and diversity are congruent. One of the reasons Holberton attracts individuals from varied backgrounds is thanks to its automated application process. Throughout the process applicants are given problems to solve, while remaining anonymous. This allows prospective students to focus on the content rather than how they are perceived by an admissions panel. This underscores that talent and motivation are what’s important at Holberton. The no-upfront-cost model also helps the school to offer opportunities to students of many diverse backgrounds. It’s not news that often times the barrier blocking individuals from post-secondary education comes down to the financial stress. Holberton’s chosen formula of learn first, pay later opens the possibility of further education to many that would otherwise not be able to afford it. At Holberton School, quality is key. The combination of project-based and peer learning allows students to learn in a more creative way. “Holberton School offers a truly innovative approach to education: focus on building reliable applications and scalable systems, take on real-world challenges, collaborate with your peers. A school every software engineer would have dreamt of!” explains Kate Volkova, Sr. Software Engineer at Microsoft. They say the mark of truly mastering a concept is when you are able to explain it simply to a peer. Holberton’s curriculum is a crash course in exactly that methodology. Recruit directly from our diverse and highly-qualified talent pool. Being a part of Holberton School’s Corporate Partners program offers organizations the exclusive opportunity to hire students directly from the source. Vint Cerf, Chief Internet Evangelist at Google and anointed “father of the internet”, boasts Holberton’s curriculum “In their internships, students end up getting exposed to a pretty broad range of stuff at Google and that helps reinforce why they learned what they learned and why it’s important…” Holberton School is producing talented software engineers who have landed positions with companies like NASA, Tesla, LinkedIn, Apple, and Dropbox. Our students are not only landing jobs, they’re receiving 95% positive feedback from their managers. Donate to help students with their cost of living. San Francisco’s cost of living is 62.2% higher than the national average. Our Corporate Partners are working to alleviate some of that financial burden. “Scality is excited to be a part of Holberton’s Corporate Partners Program where we can give back and positively impact our shared goal of removing barriers for those who cannot afford traditional higher education.” says Giorgio Regni, Scality CTO and Holberton Corporate Partner. 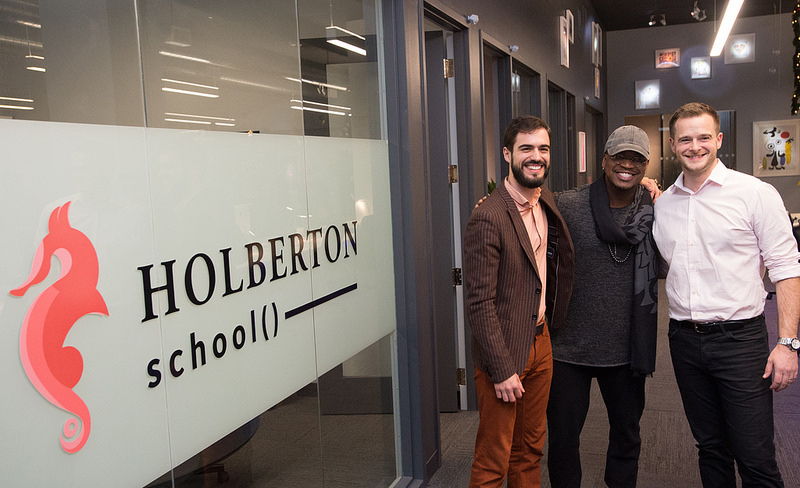 Holberton School co-founders, Sylvain Kalache and Julien Barbier pose with Board of Trustees Member Ne-Yo who is focusing on diversity at Holberton. Interested in joining our Corporate Partner’s Network? Register here!